SIGLAP V is located at 881 EAST COAST ROAD in district 15 (Katong, Siglap, Tanjong Rhu) of Singapore. 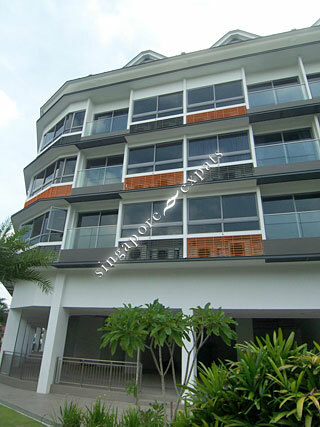 SIGLAP V is a Freehold Condo development consisting of 114 units. SIGLAP V is completed / TOP in 2012 (estimated), developed by DB2 REALTY PTE LTD.
Educational institutions like ROSEMOUNT KINDERGARTEN, ROSEMOUNT INTERNATIONAL SCHOOL, SEKOLAH INDONESIA, OPERA ESTATE PRIMARY SCHOOL, ST. STEPHEN'S SCHOOL and NGEE ANN PRIMARY SCHOOL are near to SIGLAP V.
SIGLAP V is accessible via nearby BEDOK, KEMBANGAN and EUNOS MRT Stations. Beautiful, Peaceful, Serene. Many cafe and restaurants. Lifestyle area. Management is poor and the building is poorly constructed. Cracks appeared in all the walls a meter from the exterior wall (due to settling no doubt) and management will not repair it. Windows are very thin, so you can hear every conversation and car horn that takes place outside. 1st street is a constant mess of loud delivery trucks and traffic. Management seems to turn a blind eye to rules about acceptable posted delivery times as trucks come before sunrise 7 days a week. Too far from MRT stations. Plus side: great food and bars nearby. Location very central . Very loins noise through the night from 24/7 mcdonalds .screaming and laughing , shouting heard as McDonalds staff sitting there through the night. Drunked people shouting . It's horrible . And the facilities at the condo just name sake . Pool is so small that no more than 2 people can swim . Its a very strategic and convenient place to stay. Located directly above supermarkets and along upper east coast road, its near eateries and the beach. good development for yuppies working in town or eastern area.